The sacrotuberous ligament is a strong as well as wide strap of the fibrous tissue. It has narrow lower lateral end and wide upper medial end. Adjoining upper section of the coccyx. To the medial margin of the ischial tuberosity. A few of the fibres from the lower end are continued on to the ramus of the ischium to form falciform process. The sacrospinous along with sacrotuberous ligaments are major constituents of the lateral pelvic walls. 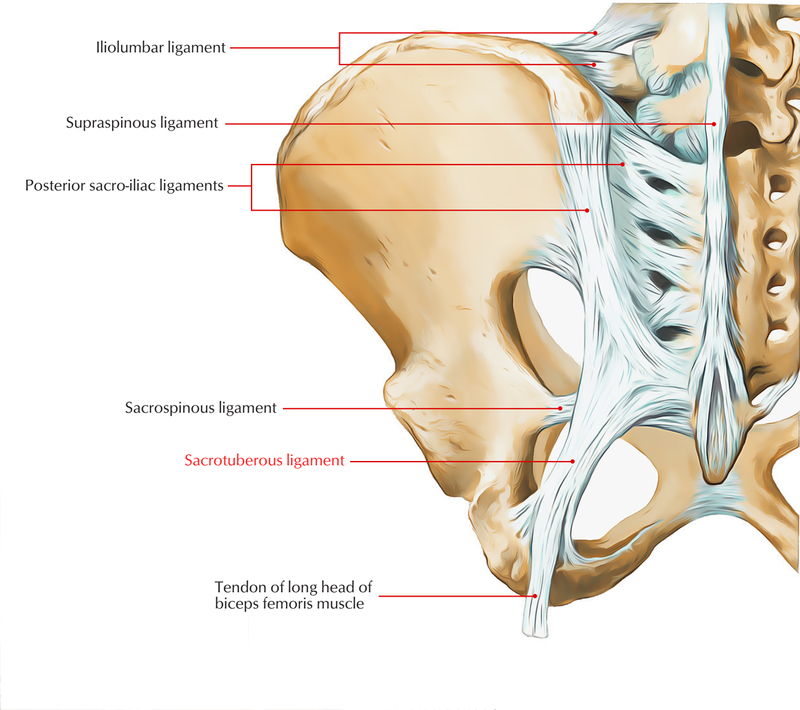 Sacrotuberous ligament together with the sacrospinous ligament help define the apertures between the pelvic cavity and adjacent regions through which structures pass. They also transform the greater and lesser sciatic notches of the pelvic bone into foramina. The greater sciatic foramen lies superior to the sacrospinous ligament and the ischial spine. Prevention of the lower end of the sacrum and the coccyx from getting rotated at the sacroiliac joint due to the weight of the body is done by sacrotuberous and the sacrospinous ligaments. Sacrotuberous ligament can become pressured and that may cause the arching of the spine during strenous physical activities or sports activities. If it becomes strained or damaged it may lead to problems just like those of a typical iliolumbar ligament injury. The ossified or bony, sacrotuberous ligament may be a critical factor in different varieties of neurovascular compression syndromes like, the abnormal compression of nerves and blood vessels.